Once the ceremony is over, every bride is looking to take off that extra weight and ruffle for a hassle-free celebration. Whether you’re cutting a cake or cutting a rug at the reception, a comfortable yet enchanting dress is in order, and here at devotiondresses we have you covered for just that. Trains and long skirts are great for walking down the aisle, but can be too much when you’re thanking your guests and walking from table to table. Tea-length dresses and knee-length dresses are a stylish option that is perfect for dancing, and thanks to its unique cut, it amplifies your bridal glow and has you looking your best throughout the evening. Ditch the layers and petticoats and hit the dancefloor in a lightweight chiffon or silk dress. Lighter fabrics are always a good idea for receptions, as they are weightless and limit no movement whatsoever, plus the flowy movements make this type of dress perfect for a twirl. Use the handy filters to narrow down the search for your perfect dress! Simple cut dresses are a great way to show off your natural beauty, and can be jazzed up with embellishments and lace overlays, and who said comfort couldn’t come with a little sparkle? The timeless classic of the fit and flare dress is where vintage meets modern bride comfort. 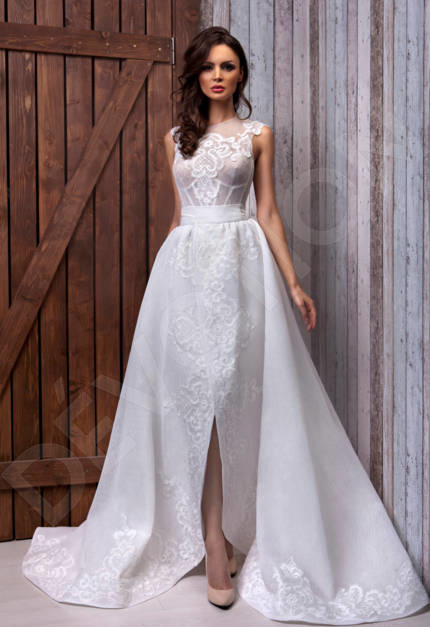 The form-fitting bodice and feminine neckline compliment any figure, and the circle tea or knee-length skirt add a stylish and girly touch to your bridal look. With new styles added regularly, browse the latest reception dresses straight from the bridal runway!